Pandan - What is it? How do Pandan Leaves taste in Desserts and more? Know what pandan is and where to buy it. Find out what pandan leaves taste like including notes on flavor and paste extract, plus more about a great kitchen dessert cake recipe. Pandan (a.k.a. screwpine) is a tropical plant made up of long green blade-like leaves. It is native to Southeast Asia and its aromatic property makes it a popular natural flavoring component for dishes and desserts. What does pandan taste like? Although it is frequently compared to vanilla, this is primarily due to it being widely used in cooking throughout India and Southeast Asian countries like Thailand, Malaysia, Vietnam, Burma and the Philippines. The fact is, raw pandan tastes quite grassy. But when it’s prepared with various dishes and desserts, it has a very unique taste that can be described as a creamy coconut, banana-leafy, slightly nutty flavor. However, these flavors are largely derived from the other ingredients that it is commonly combined with like coconuts, lemongrass and other garnishes. Pandan is another ingredient commonly found in Filipino desserts. Like ube, it’s known for its striking color. Unlike ube, its color is not naturally as vivid. 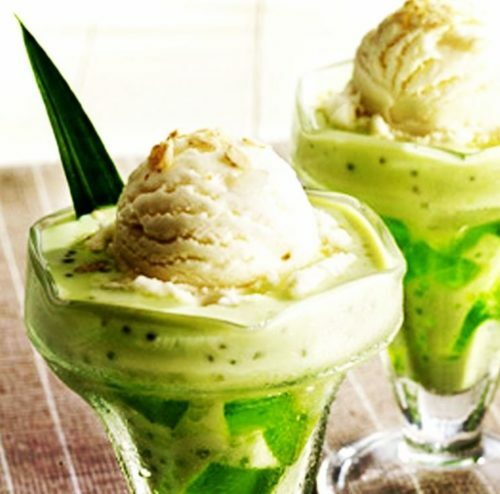 Thus, it is usually mixed with suji leaves (which look very similar to pandan leaves) to intensify the greenness. It’s often found as an alternate flavor to ube in many Filipino desserts like: cakes, pastries, ice cream and other sweets. It is also typically served in a young coconut-based dessert called buko pandan (buko means coconut in Tagalog). 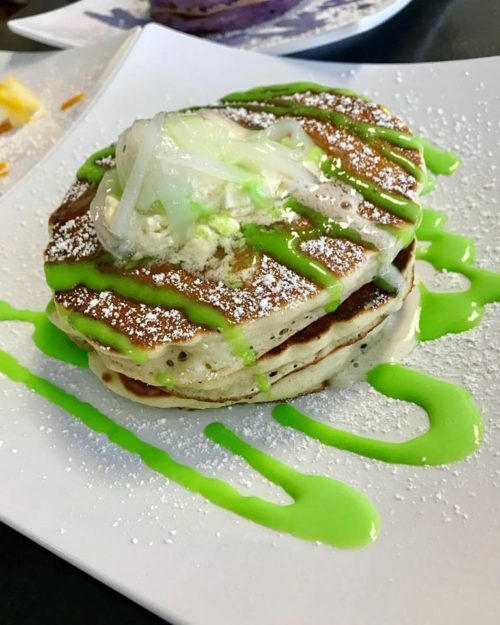 Internationally, pandan is still growing in prominence since avocados and matcha green tea have had majority ownership of the color green in non-leafy foods through the 2010s. 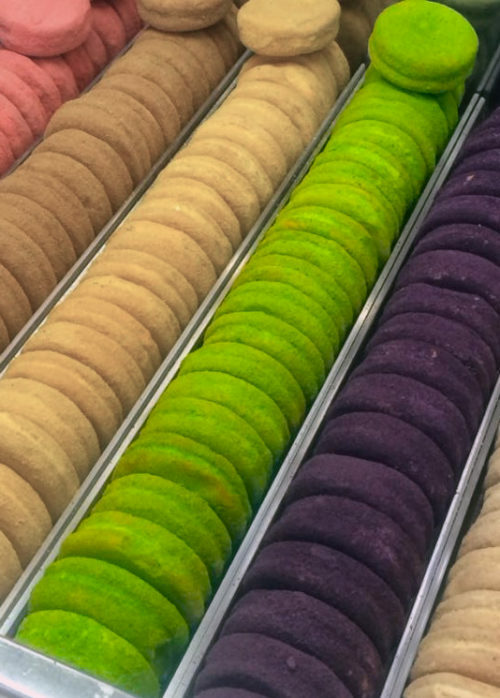 However, avant-garde dessert shops in the US have been using it in soft serve ice creams, mochi ice cream, crepes, waffles, cookies, macarons and more. Restaurants and eateries that serve South and Southeast Asian cuisines may serve dishes with pandan. Also, many Filipino eateries and dessert places use this one-of-a-kind flavor in their foods. If you’d like to try it yourself, here are some places to visit. How can I make it? Because it is a source of flavor and not a specific type of food, pandan can be made into many different treats. 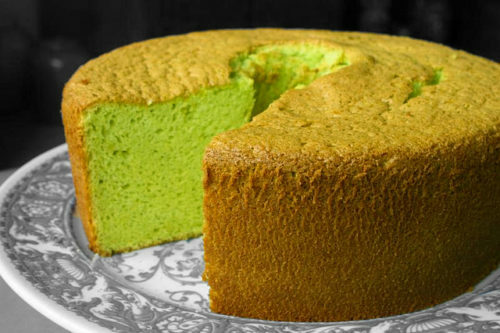 One of them is this simple cake recipe that can serve as the foundation of other uniquely-flavored baked goods for you to make in the future. First, pre-heat the oven to 300° F.
Slowly mix the yolks, sugar, vegetable oil, coconut milk and pandan extract or paste in a bowl using your electric mixer or whisk. Mix until evenly incorporated. In a separate large bowl, mix the flour and baking powder. Then form a crater with the flour to hold the wet ingredients you mixed earlier. Pour the mixed wet ingredients into the middle of the flour crater and slowly mix until everything is evenly incorporated. Set aside this wet flour mixture. With your electric mixer (or your whisk), whip the egg whites until soft peaks are formed. Add the cream of tartar to the egg whites and keep mixing until stiff peaks are formed. Slowly and carefully combine the whipped egg whites with the wet flour mixture to keep as much air in the egg whites as possible. Gently fold over and stir until even and pour into angel food cake baking tin. Turn the tin over on a plate and let cool for at least 10 mins. Remove the cake from the tin and enjoy!